Justin Richel blends familiar and historical imagery allowing for misinterpretation to occur. 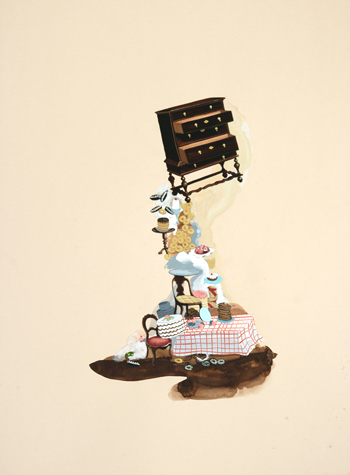 The result is a new visual narrative, created from the image's inseparable pre-existing connotations. These images are often misleading, yet they contain elements of their past and reflect our current condition. In his paintings of sweets, multitudes of sugar-coated inhabitants come together to construct towering mountains, pillars of sugary strength and the destructive forces of confectionery whirlwinds and tsunamis, confronting a society in which success is measured largely by one's ability to consume. Richel's "big wigs" are ostentatious men with wigs that topple, billow and swirl like plumage -- symbols of status, power and conspicuous consumption. Birds nest in their hair and natural events such as fire take their toll, but all the while the big wigs struggle to save face and maintain their proud and victorious posture, ignoring their surroundings and predicaments. These paintings subvert the traditional genre of portraiture by approaching the subject with the sentiment of an iconoclast. Richel's intention is to “rebuild” the image rather than destroy it, taking advantage of the cyclical nature of history and its unfailing tendency to repeat itself. Matt Cote’s energetic paintings sing with the complexity of emotion. 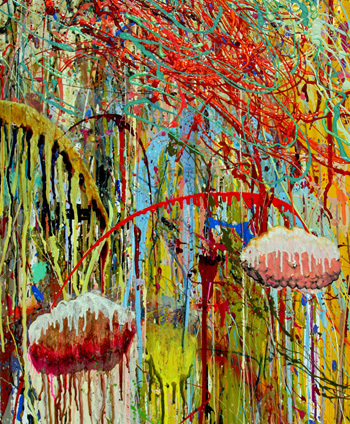 Stabs, splashes, and splatters of color are interwoven with layered, repeated marks that hint at imagery but defy specificity. Instead, his work emerges as a palimpsest, analogous to the stages of grief. With elements that are both celebratory and melancholy, these engrossing works illustrate a full range of human emotion, from elation to devastation. In the artist's words, "the series being exhibited came about after the abrupt and unexpected death of my best friend. As an artist I was able to use painting as a release for aggression, depression, confusion, misery, loss and loneliness. Even though losing her will scar me for life, at least I was able to honor her through creating beauty for others to enjoy. In time, the pain of losing a loved one will fade, but she will never be forgotten. I love you, Luka"